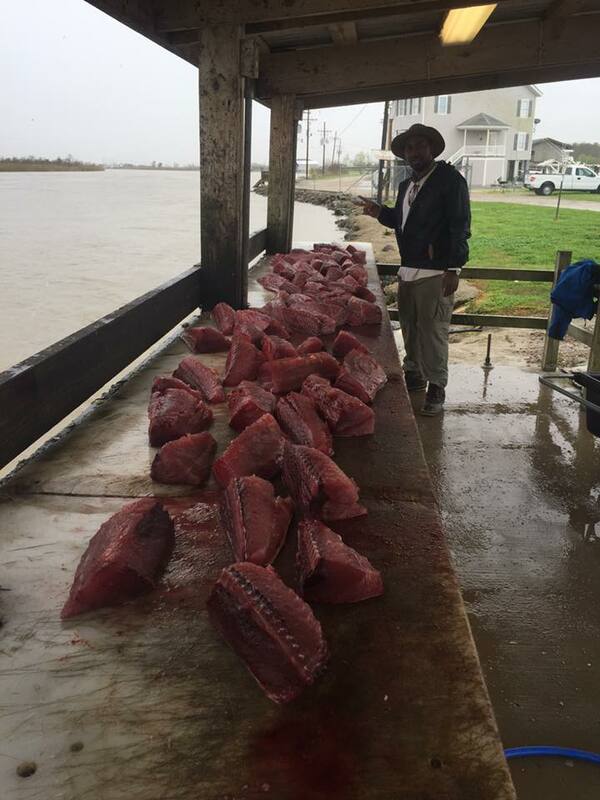 The Holiday Season is in full swing and so is the BIG YELLOWFIN TUNA BITE out of Venice, Louisiana! 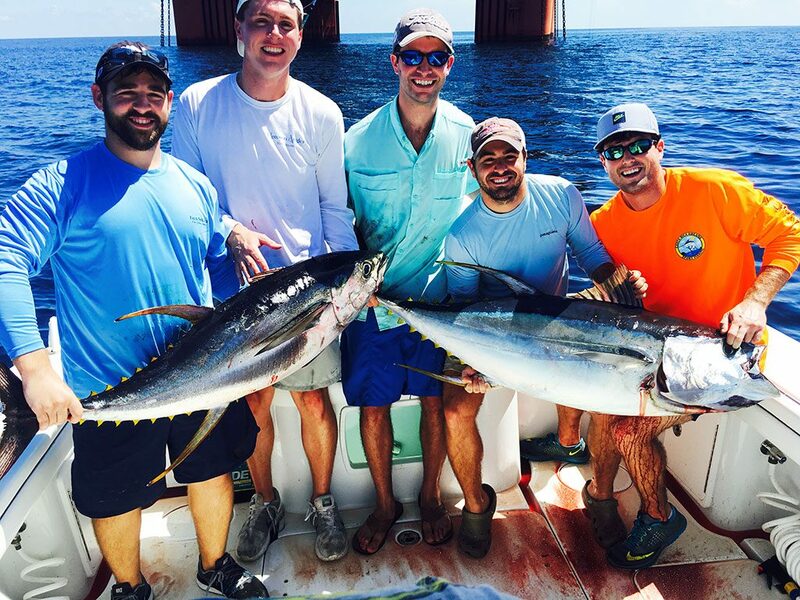 The Champion Charters Team can barely get to the offshore tuna grounds without double and triple headers! We’ve been shadowing the shrimp boat fleet (yes, even a few “Jennys” are out there) in order to target Yellowfin Tunas and Blackfin Tunas. 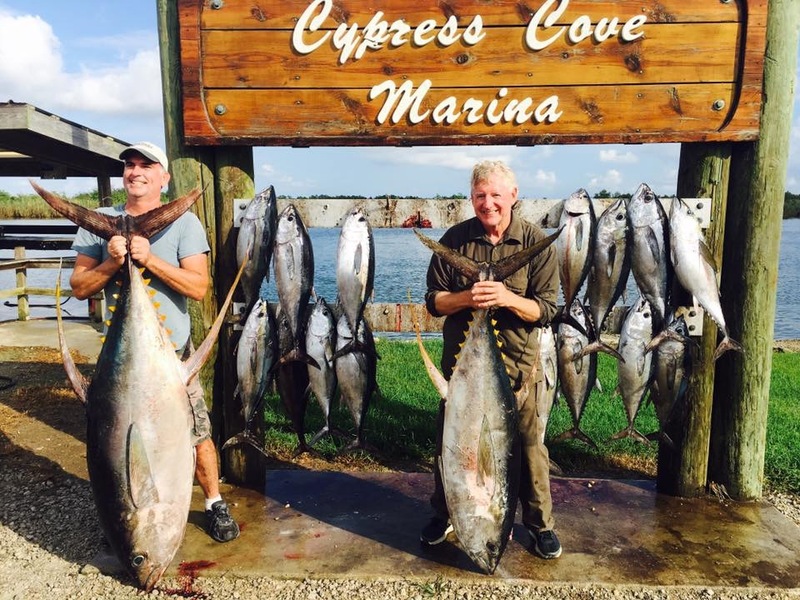 This is one of the most exciting Fall/Winter fisheries in the Continental United States as our anglers get to pick and choose which tuna they want to hook. The cobalt-blue water offshore is so clean and clear that we literally watch the tunas come up into spread of baits. 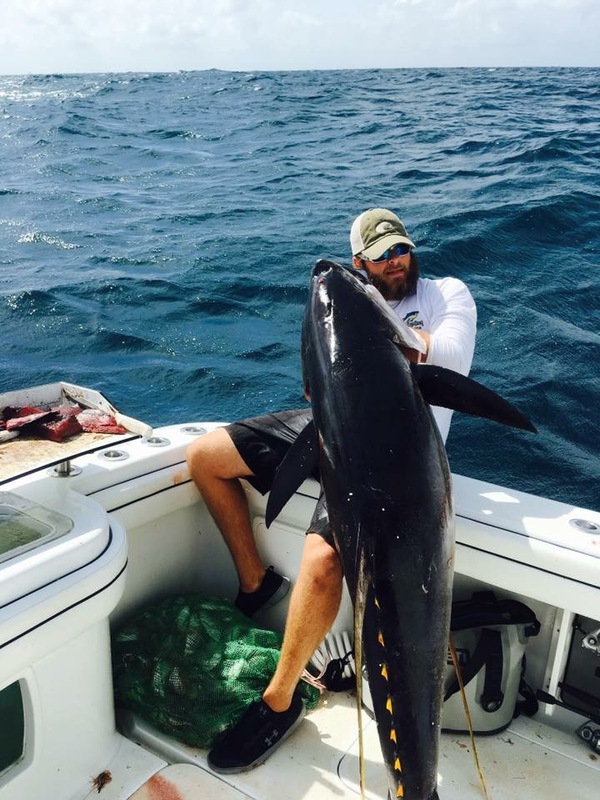 Are you looking for a 200-pounder? Cast over there at 3 o’clock…and hang on. Do you want something in the 60-pound class? Here you go…pitch just behind the motors. 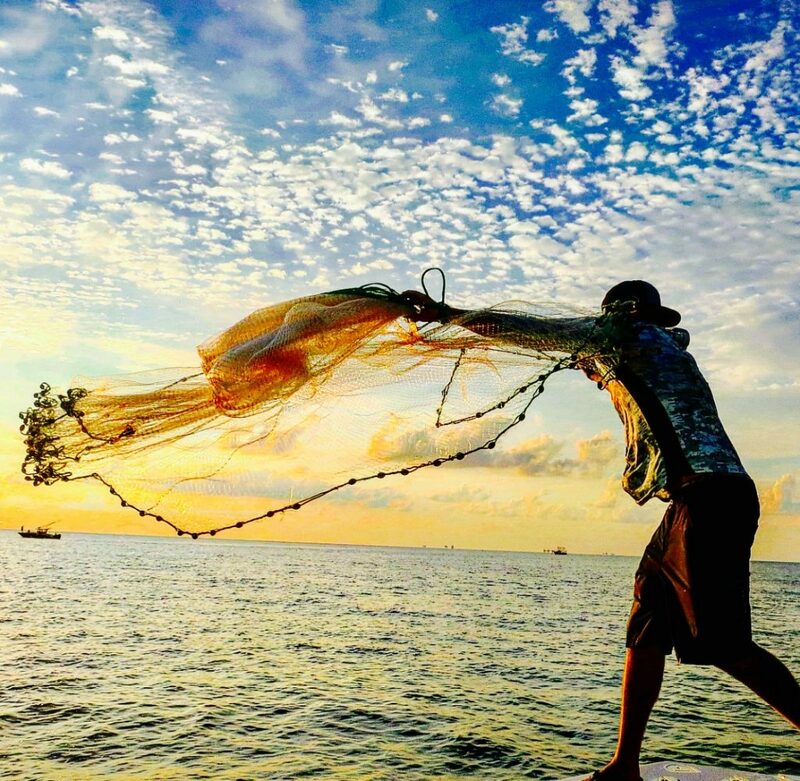 Fishing near the shrimp boats is an experience unto itself as our anglers get to watch them work to harvest their bumper crop of shrimp. 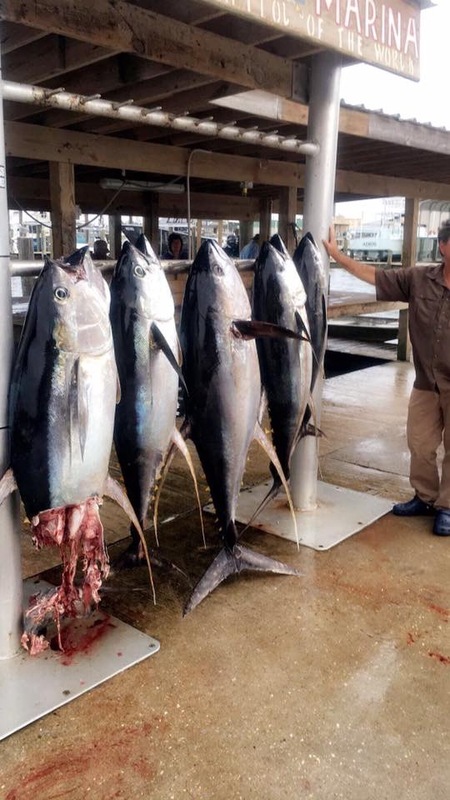 As the shrimp boats “do their thing,” various tuna species and other predators stage behind the boats as scrumptious morsels known as “by-catch” drift slowly in the boats’ wake. 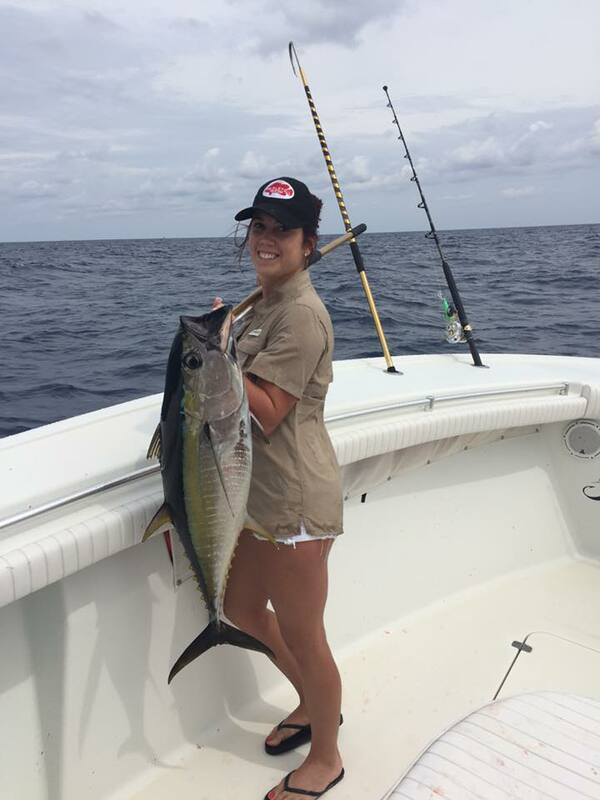 The Champion Charters Team knows just how to take advantage of this situation. 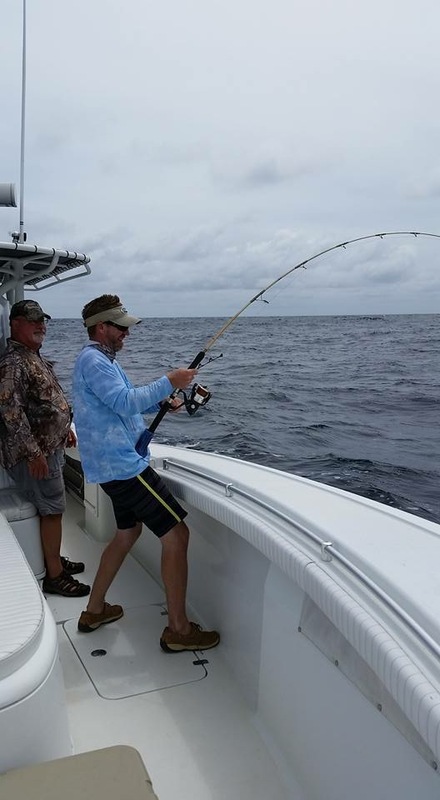 Using our world-class Yellowfin Center Console to maneuver our anglers with surgical precision, we place our live baits between the tunas and the all-you-can-eat buffet streaming off the stern of the shrimp boats. This is where the magic happens. 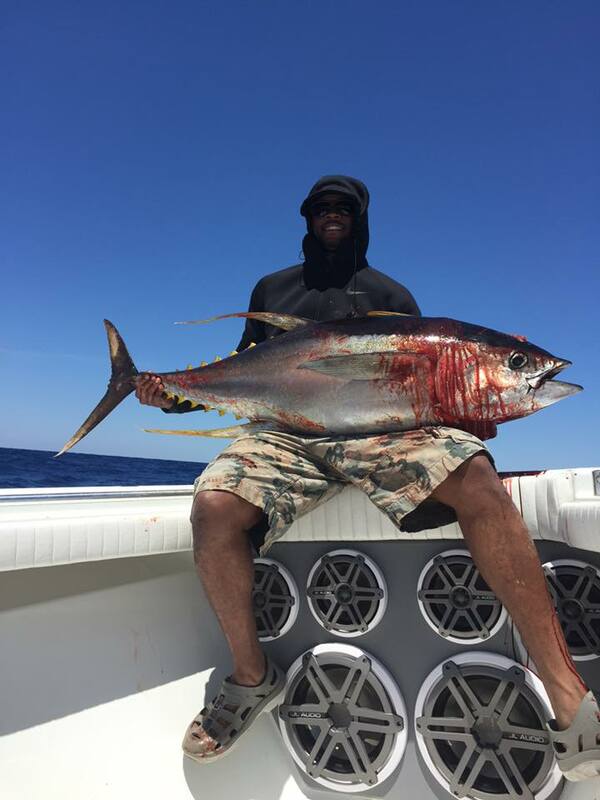 The huge tunas cannot resist our baits that are the size of hog legs. P.S. 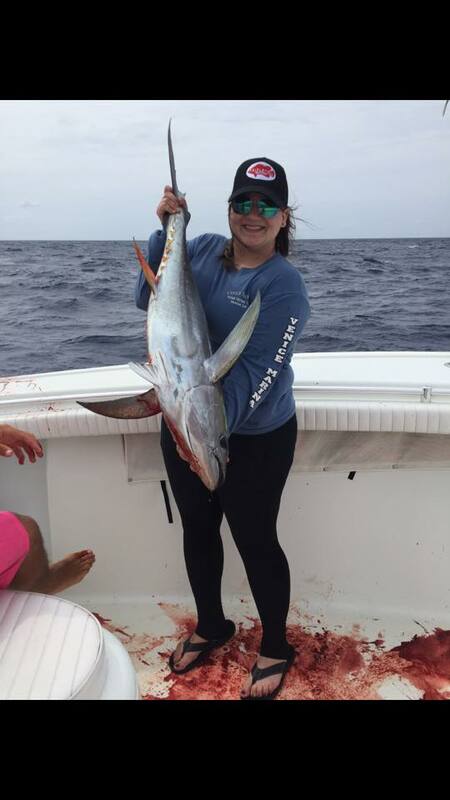 This is one of the biggest fish we have caught to date! The Big Fish Are Here! 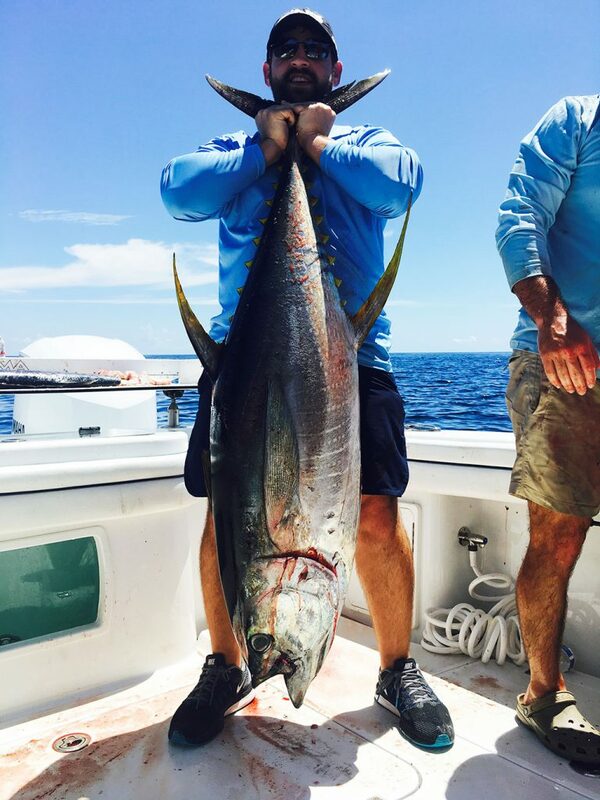 The number one question I get asked by our customers is, “When Is The Best Time Of Year To Catch Big Tuna?”. Well, now is the time! We have had an unreal past couple weeks with some of the best fishing we have seen in years. Our fall season is always incredible here in Venice, Louisiana, but there is something absolutely special going on this year. Looking at my captains journal and logs from the previous years, we were not into the big fish quite this early. It’s possible due to the tropical disturbances, that things kicked off early. I believe this will be the story of the entire fall and into the winter. 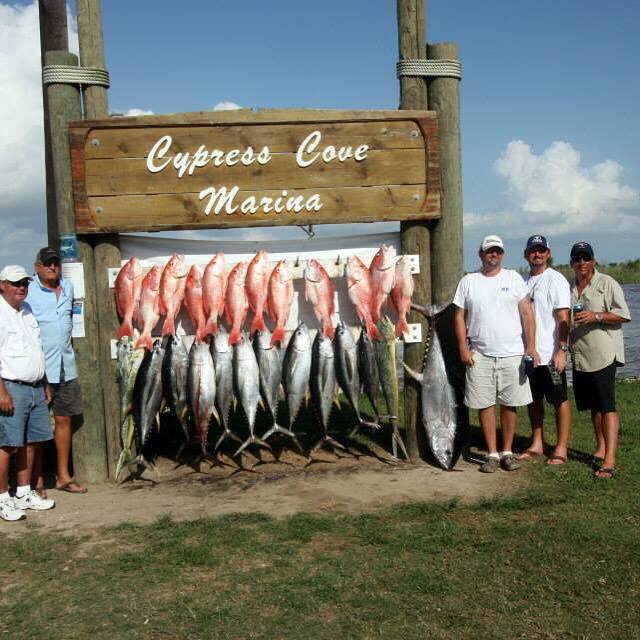 As long as we get good weather, we are going to have a great chance at some really big fish on each and every trip. As the temperatures begin to cool off, we will be switching gears a little bit in order to put our anglers on the fish, but one thing will remain consistent, the fish are BIG and test our anglers. We have beefed up our leader and tackle size to ensure you always have the best chance at landing a pure monster out here. 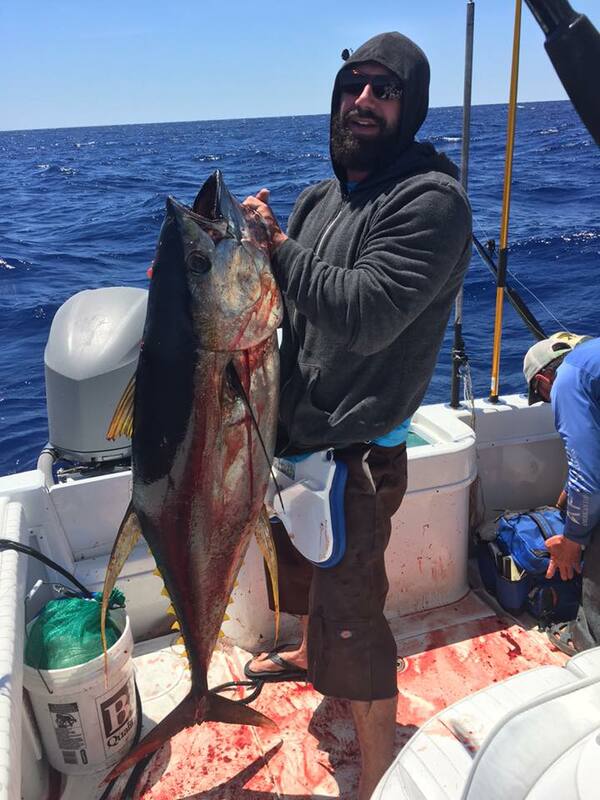 Other than tuna, there has been some good sized mahi, marlin and swordfish on the deep drops, however our focus is 100% to put you on the big tuna as this is surely the best time of the year. 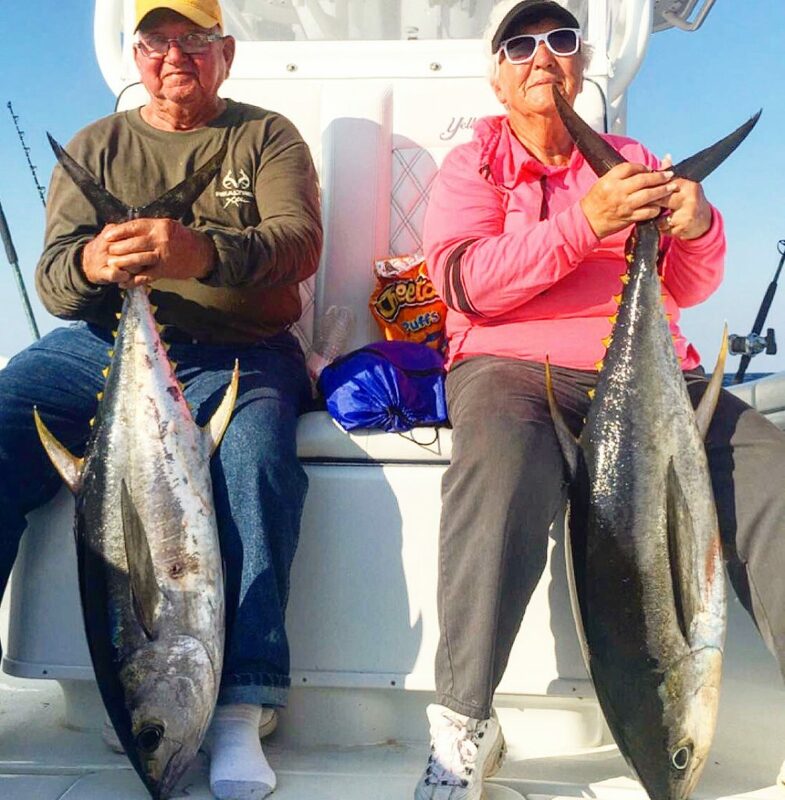 We still have dates available in October, November and December, so I highly recommend you reserve your trip right away to take advantage of this great tuna fishing bite. 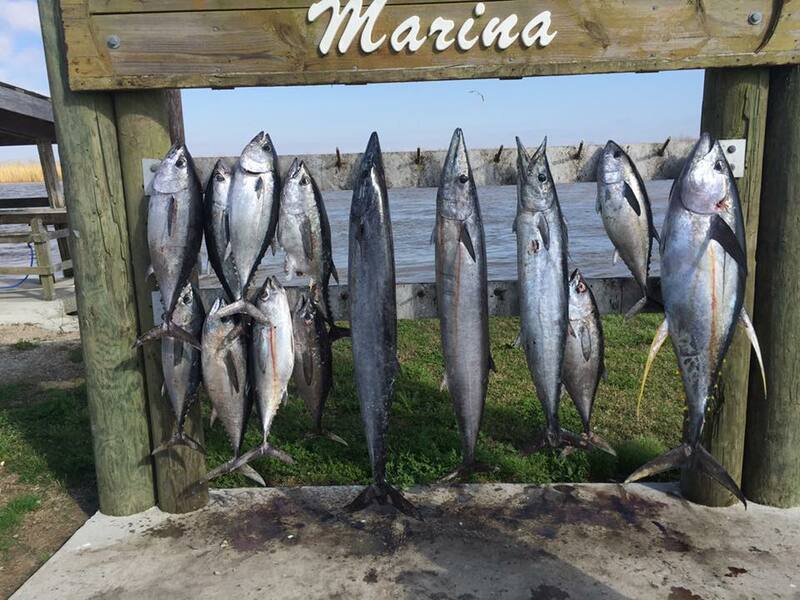 If you have never fished in Venice, LA before, it is one of those places every fisherman must experience at least once. 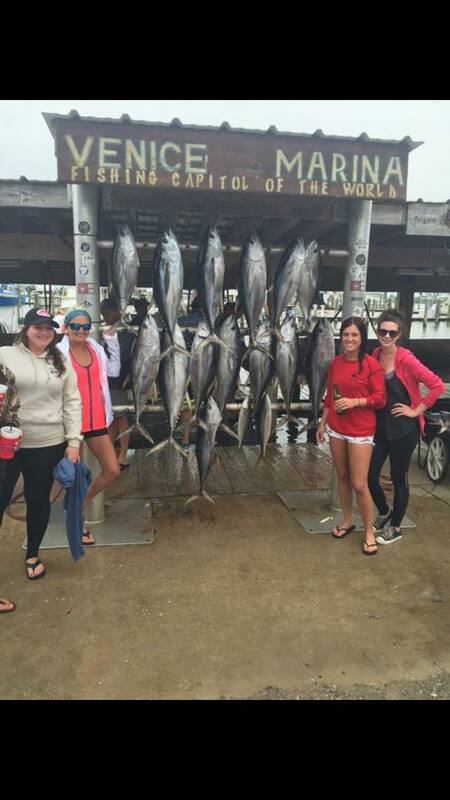 Once you arrive to the area, you will smell the clean salt air and soon realize why we are famous for Tuna fishing. You will be staying at the beautiful Marina/Hotel – Cypress Cove. We keep our boat only steps away from your room, so that you may just hop on in the morning with your hot cup of coffee. Once on our brand new 2017 36 foot Yellowfin boat, we will make our run to the fishing grounds. Powered by triple 300 Yamaha motors, we are one of the fastest boats in the fleet, getting you to the fish first in order to give you the best opportunity at catching trophies. All our trips our full days (not overnights), so time management is always our priority to ensure we use every minute wisely. We may stop to get live bait early in the am when we know the fish are biting best on live baits. Here we are throwing the cast net to fill the wells. As we proceed offshore, we are looking for shrimp boats, birds, busts, etc. Anything to give us signs of tuna. 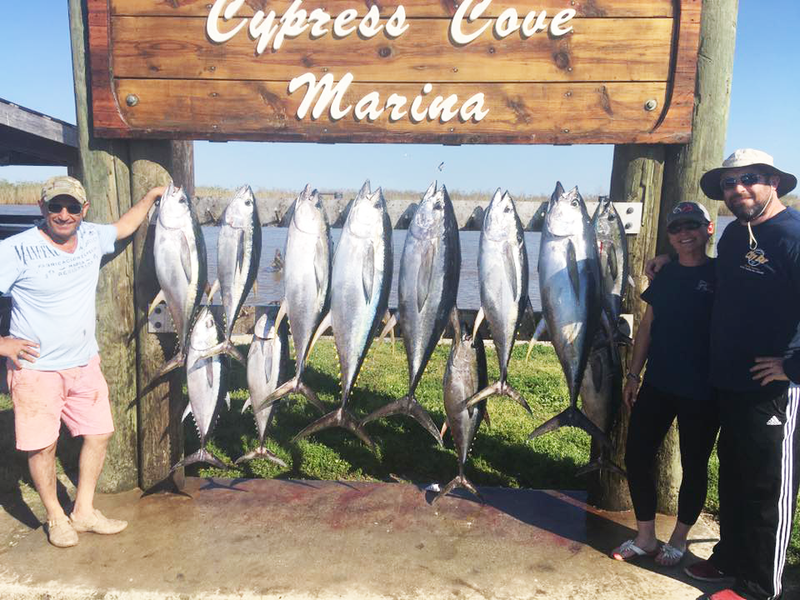 By running trips daily (100% full time) and keeping excellent log books on tides, winds, moon phases and various other patterns, we have a huge advantage over the part-time fleet that only fish on the weekends. 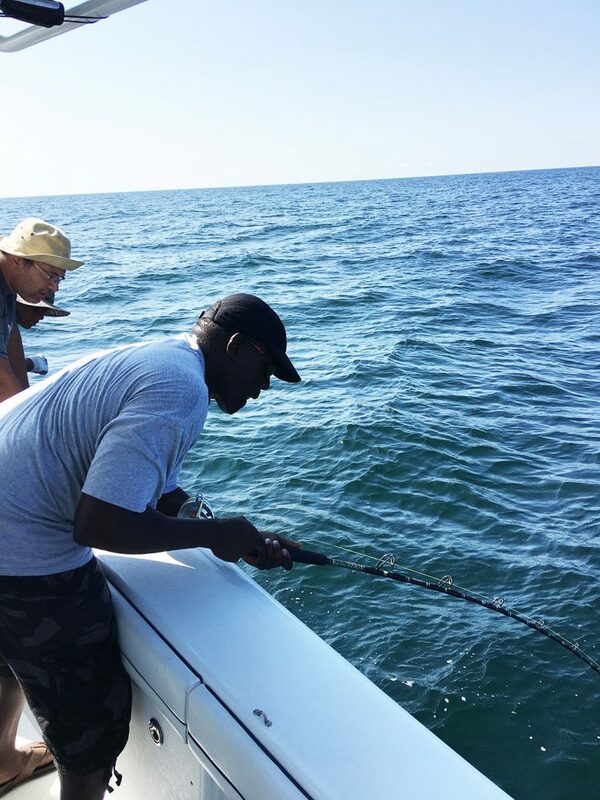 As we begin to get into the fish, we will coach you no matter your age or experience level. 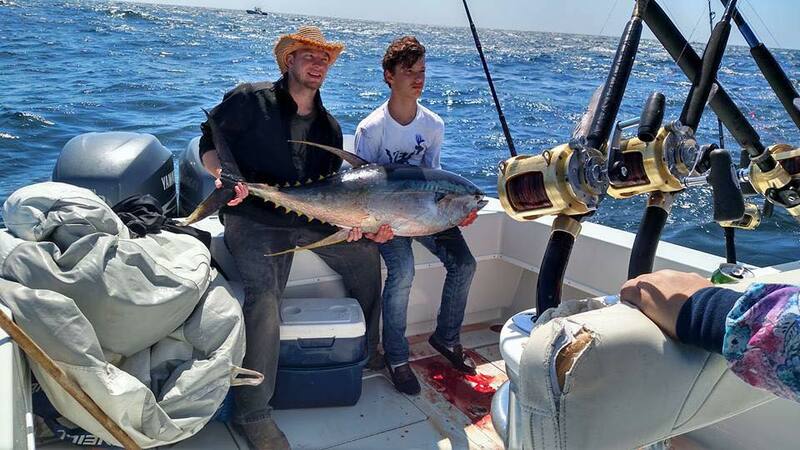 In fact, we even have young kids tackle tuna over one hundred pounds regularly. 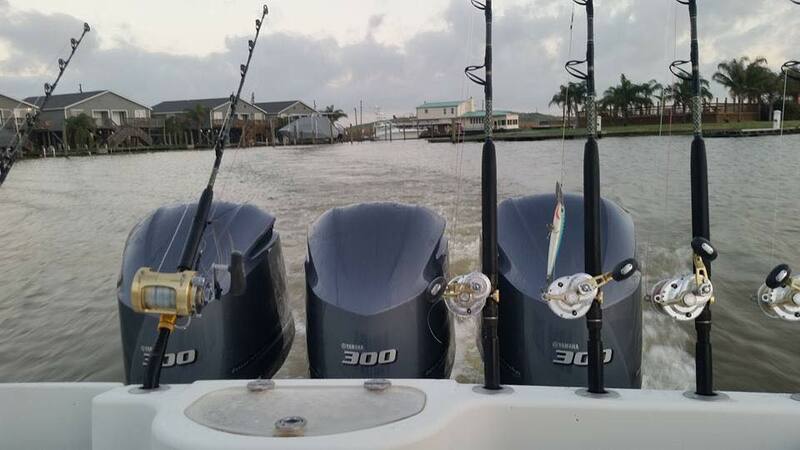 Be ready for a battle than can last an hour depending on how big the fish is. When you get the fish close to the boat, we are ready with the gaff to bring her inside the boat. High fives and large smiles shorty ensue and you have done it! Back at the marina, we clean and bag all your fish (we don’t sell your fish!, Beware). We have ice here as well and all you need is your cooler. If you are from out of town, you can check your cooler with your airline or we can use Fedex to ship your catch back home carefully packed in a styrofoam cooler and the right amount of ice. Our marina can handle that for your as well. 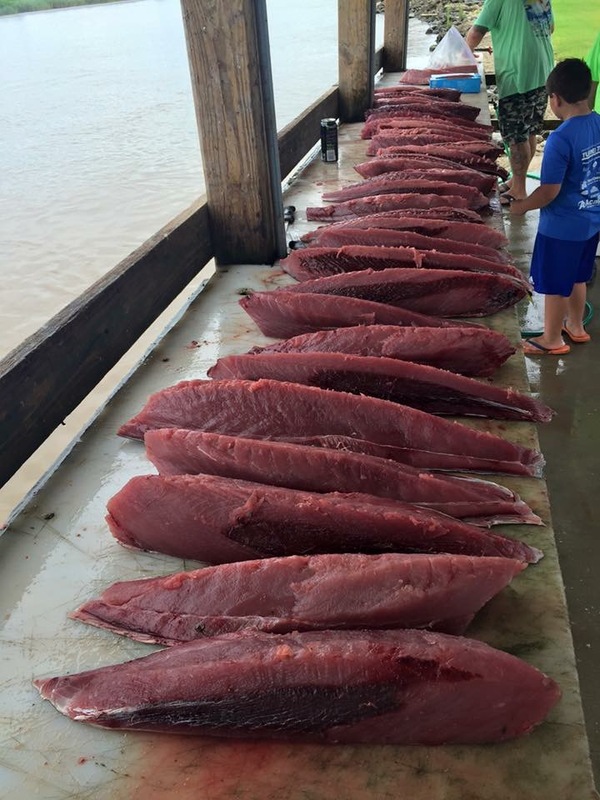 Either way you are going home with a long time supply of fresh Yellowfin. Sushi, grilled steaks, sashimi.. It’s up to you. That’s the report for now, please give us a call to book your trip. 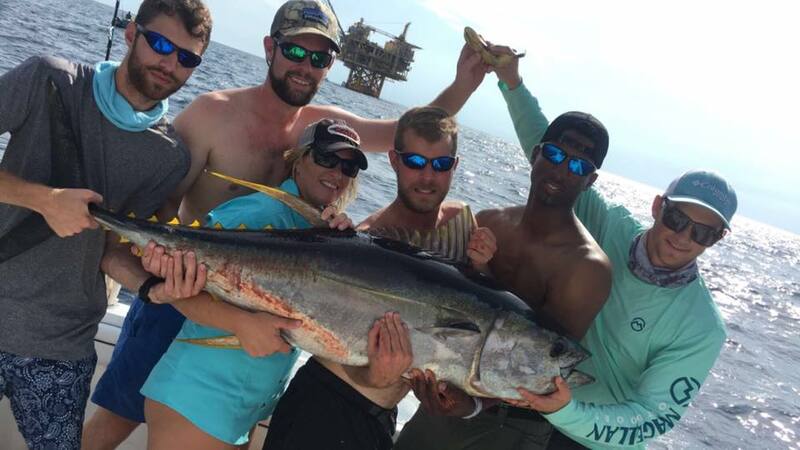 If you have fished with us before, I welcome you to come back and experience some of the best fishing in the world. Are Banana’s On Fishing Boats Bad Luck?! If you haven’t heard, bringing bananas on a fishing boat is typically bad luck. In fact, old and grumpy captains have been known to cancel trips when a group shows up with a sack of bananas. But hey, they make great snacks when offshore fishing right? I don’t warn my customers about this ancient myth and 1 out of 5 groups show up with them. While I would advise you to leave the bananas at the dock, I totally cracked the myth AGAIN this week. 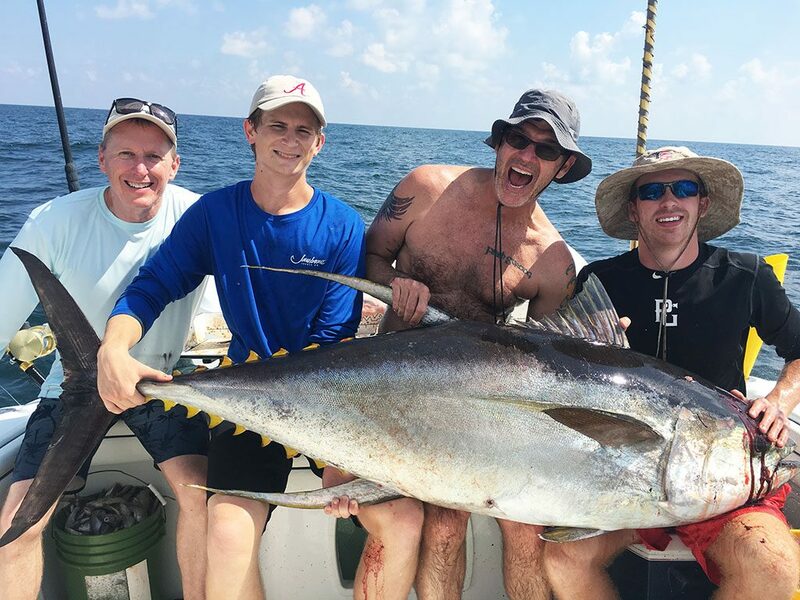 Just check out this funny photo with a great group of clients we had getting on a nice tuna! 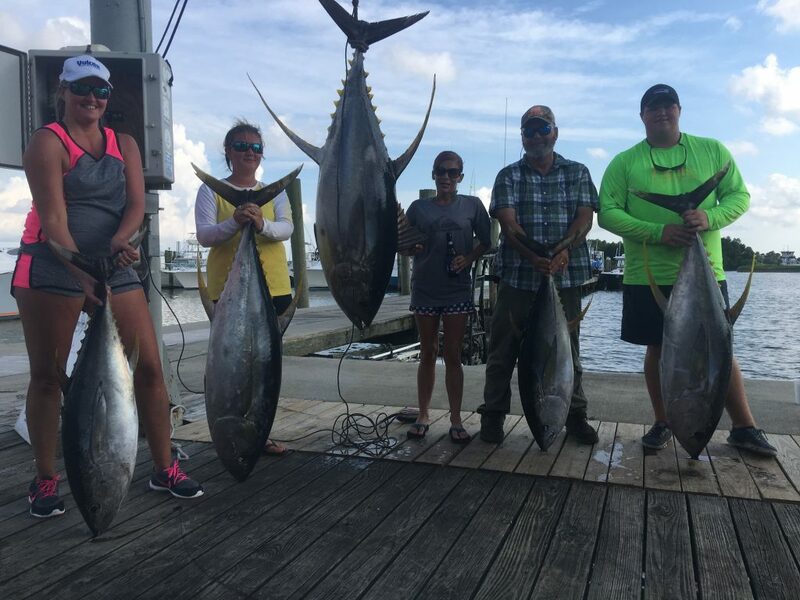 The tuna have been ranging in the 60 to 100 pound range and they are going to keep getting bigger as we approach the fall season which has the biggest tuna of the year. 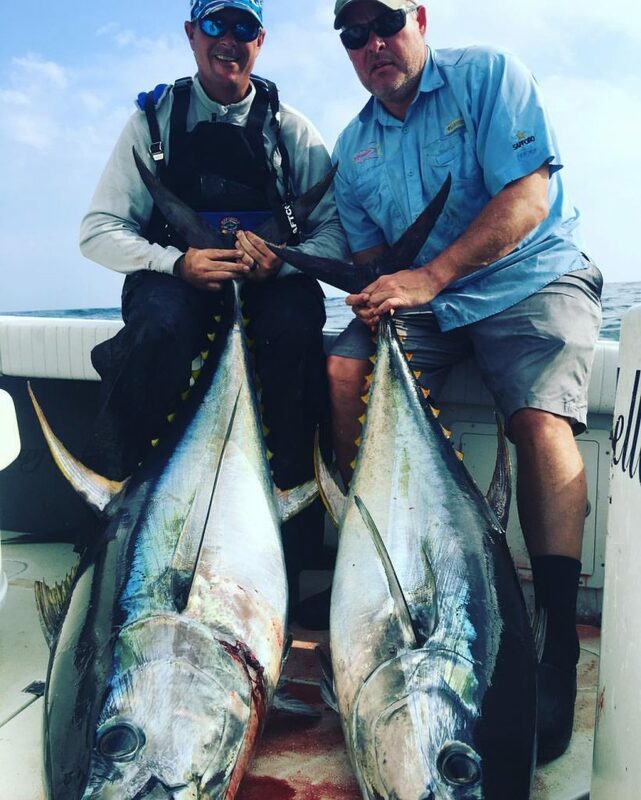 If you have been waiting for the biggest tuna of the year to book your trip, I highly recommend you get on the calendar for September and October if I have your day available. Please give myself or Sonny a call today to check the calendar and see what we have available for you. 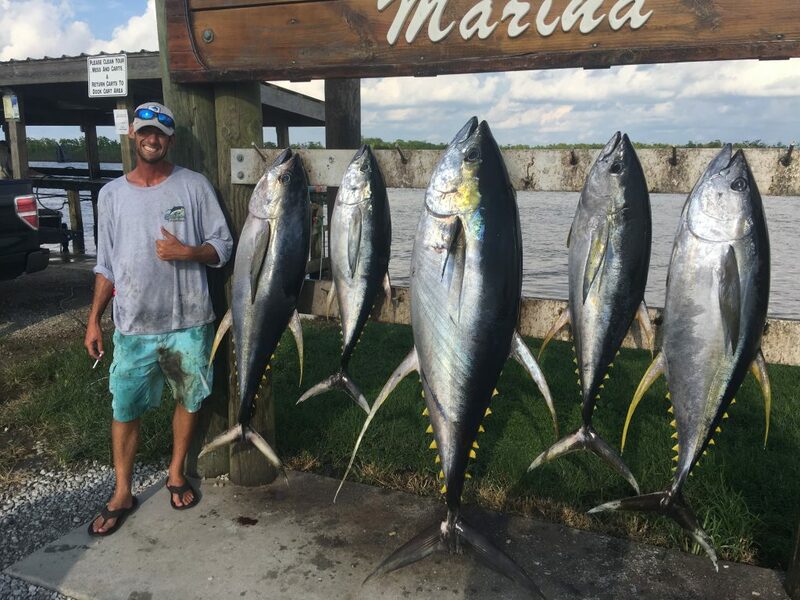 The tuna fishing this summer continues to be very good. We are finding some really big fish along with our typical summer fish. 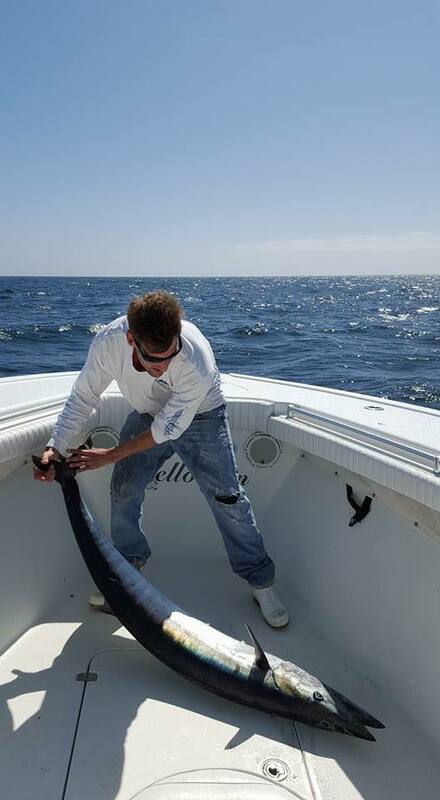 When the bite slows down we are dropping for swordfish and having great success. 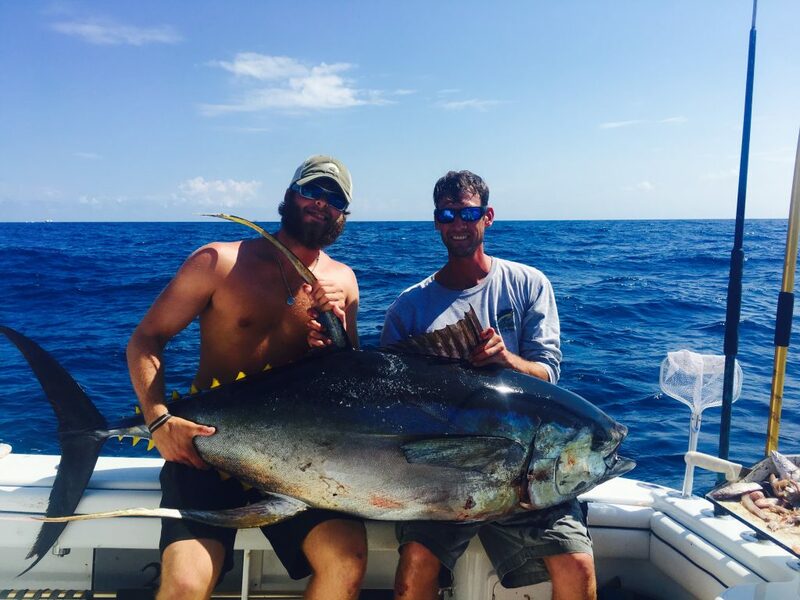 If you are looking to go tuna fishing, now is the time. With flat calm seas, we are able to run out to the fishing grounds faster and read the water easier. I have some openings left in August, so please call me for availability. Now enjoy the pics! What a spring it has been here in Venice, Louisiana! 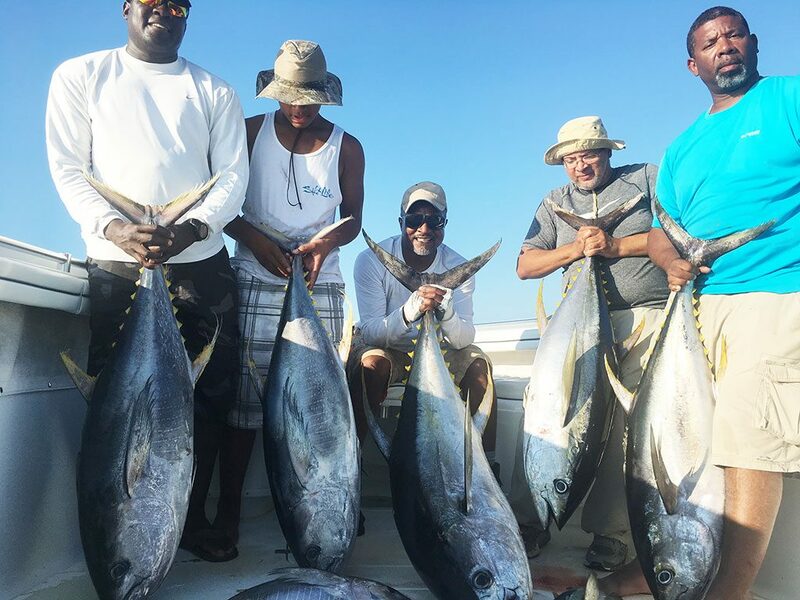 This has easily been one of the best years we have seen for tuna fishing in a long time and I expect it to continue throughout May and into June/July. 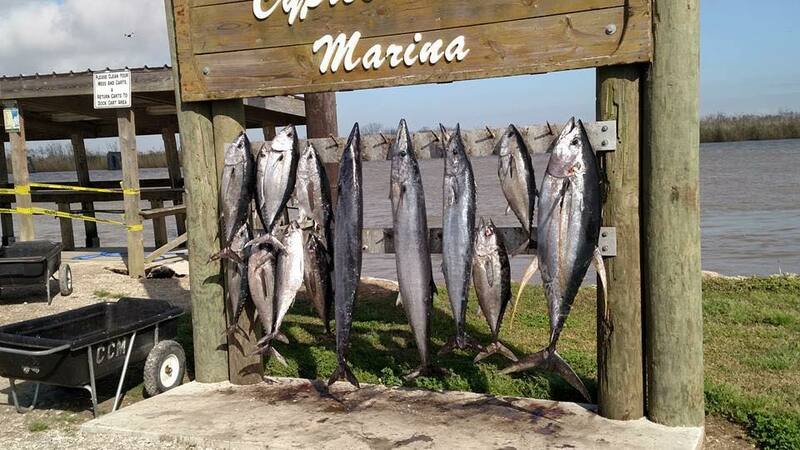 The tuna have ranged in the 60 to 100 pound range with some whoopers thrown in. I am super excited to announce that we just took delivery of the new boat. It is similar to our other 36′ Yellowfin however it includes some awesome new technology, motors, etc that will help us in putting you on the fish. It is my passion to give my clients that highest end gear, boat and captain experience possible each and every trip which I was I am always updating and keeping with the changes in the industry. The new motors are more efficient than my previous ones which means a less fuel bill at the end of the trip as well as faster cruise speeds to the fishing grounds. 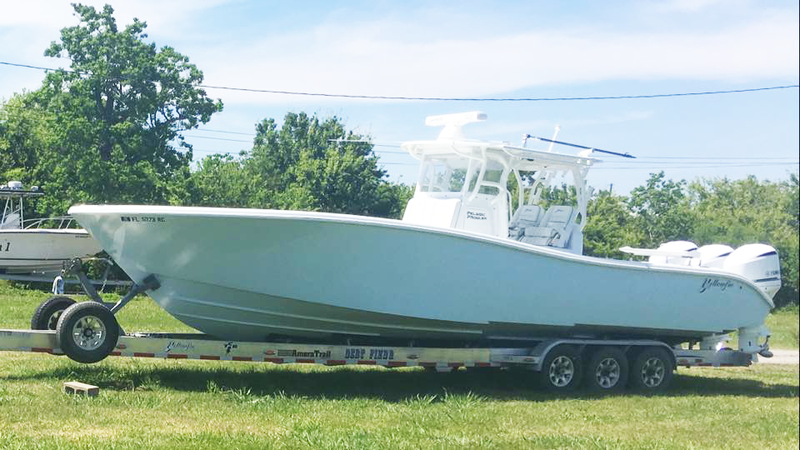 Here is a sneak peak at our new 36′ Yellowfin with Triple Yamahas. 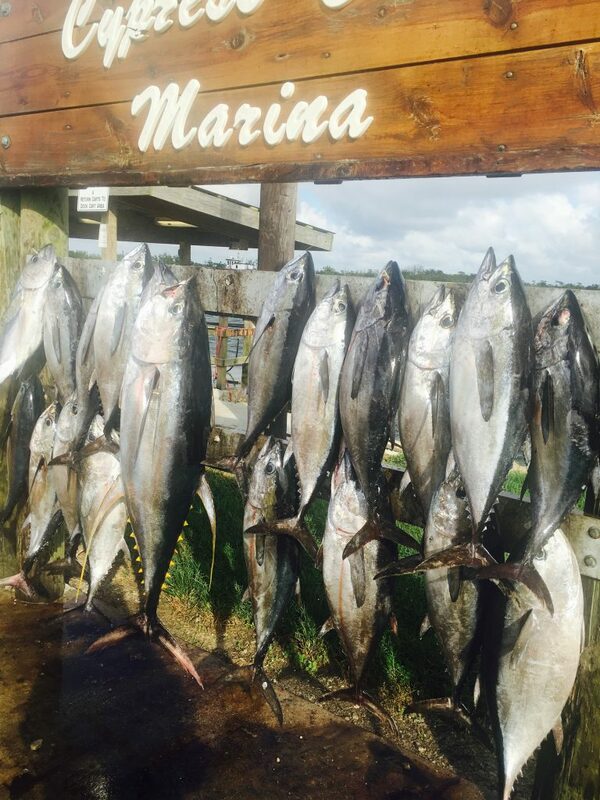 Now on to the tuna…we are switching up our fishing strategy as we now have live bait including threadfins and porgys in the area. 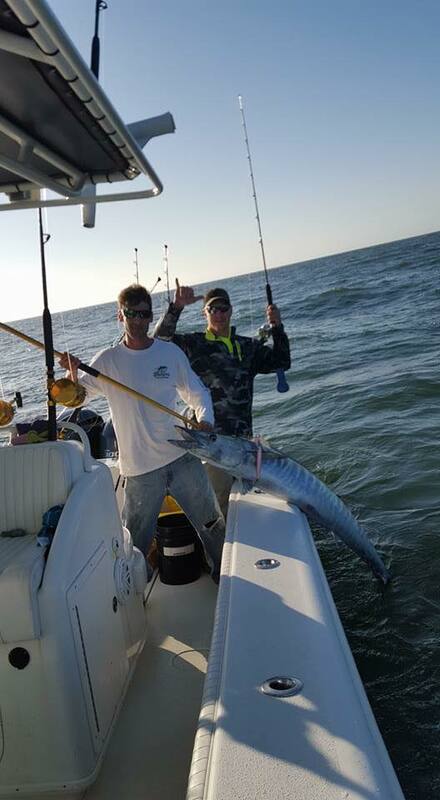 With the live bait we are fishing the floating oil rigs and having our best success early in the morning, however some days we are getting the bites in the middle of the day as well. Looking for temperature breaks, birds, rips, etc has all lead to finding the tuna. As we cruise out in search of tuna, we are finding beautiful rips and edges that have been holding really good Mahi. 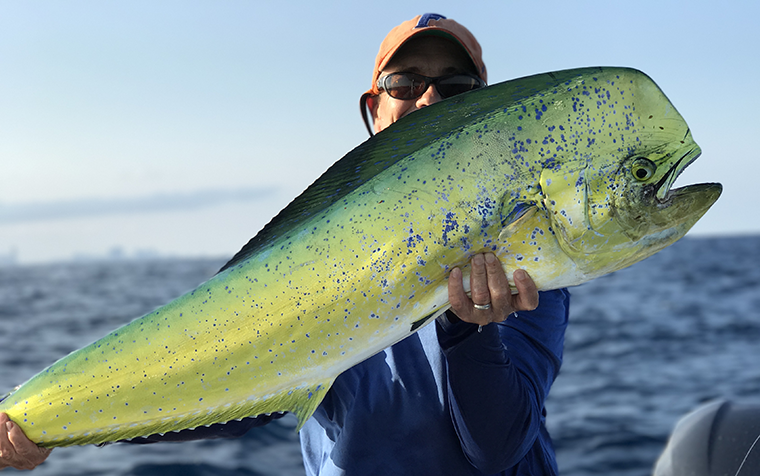 While tuna is just about 99% of our focus, I don’t think any of our clients have told us to keep running past one of the most beautiful fish in the ocean, the mahi mahi. 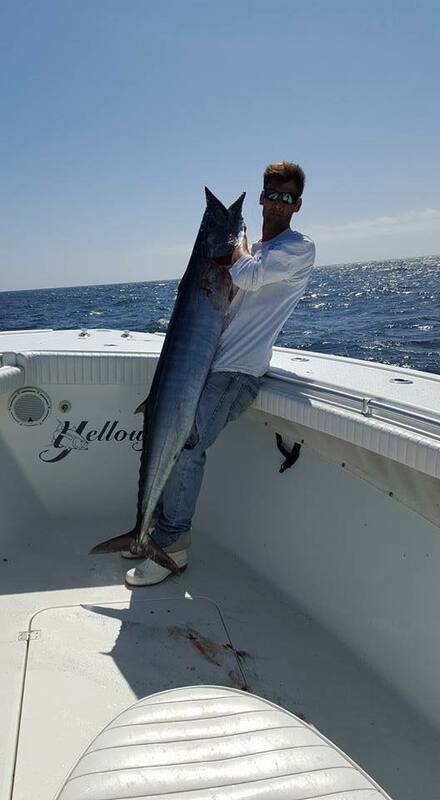 A fish of about 20-3olbs is always a rush and puts up a great fight on spinning tackle. 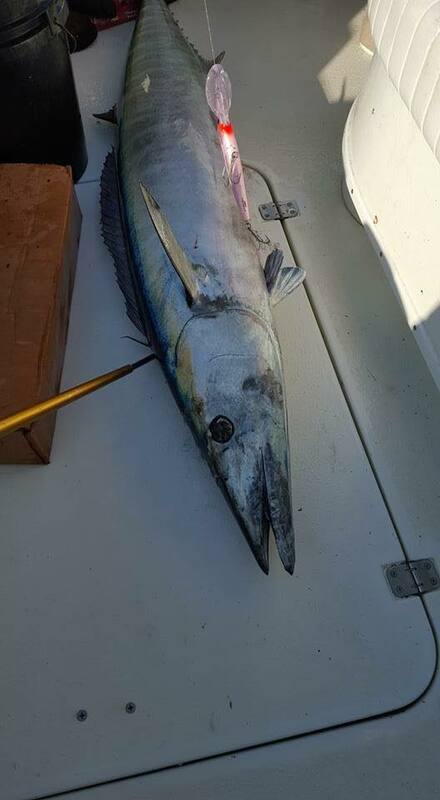 We are also getting them on live bait, however mahi will eat trolled lures and dead baits as well. 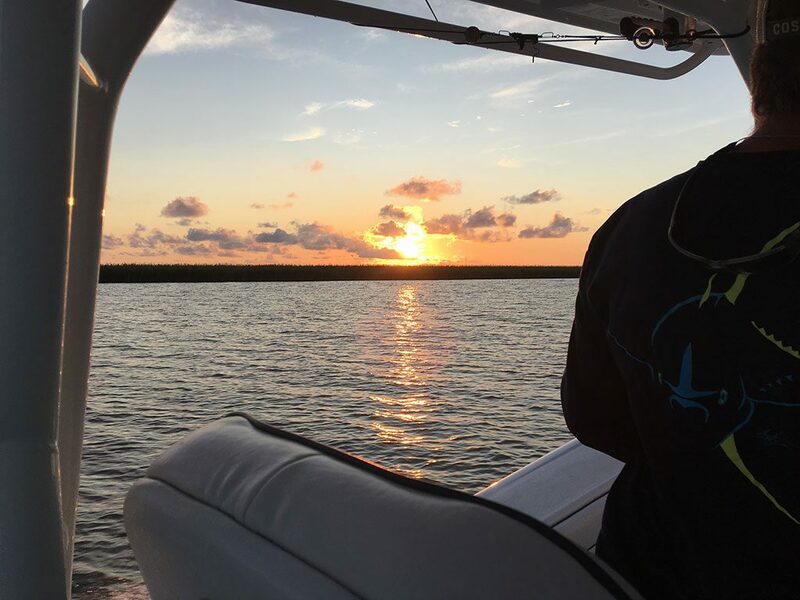 As the temperature continues to get warmer here in Venice, LA, we will be looking to get on the fish earlier in the morning by beating the fleet. If you can book a weekday, I always recommend it, however weekends are fine as there is a lot of area to fish even with several boats out there. 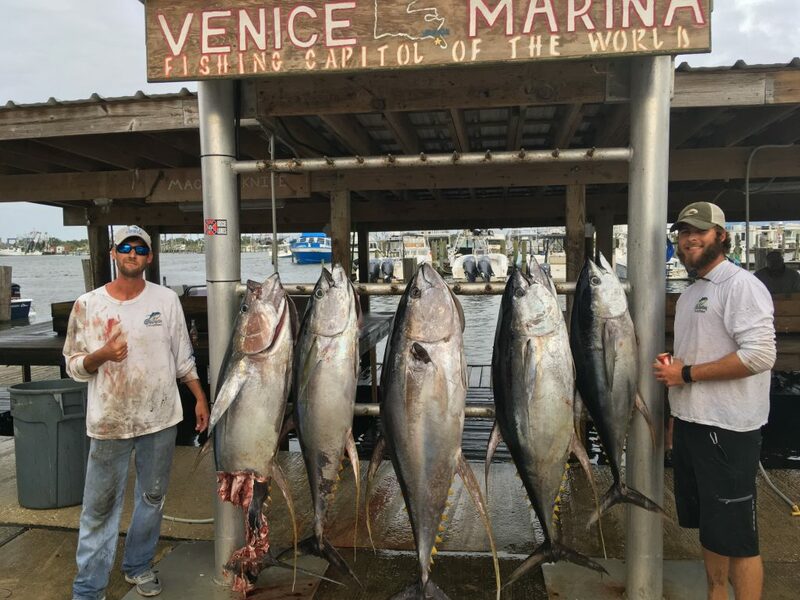 The best time to go tuna fishing in Venice, is when you can go! It is a year round fishery here, however there are times of the year when the fish are bigger. 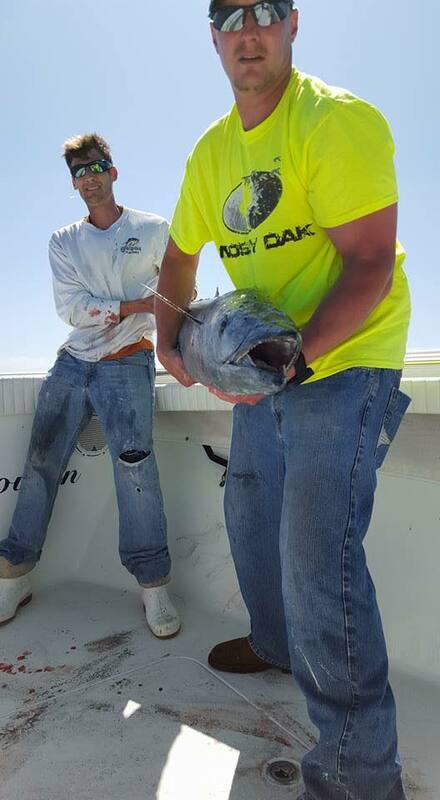 In the next couple months the average fish size will be between 40 and 80 pounds with the trophy going over 100. 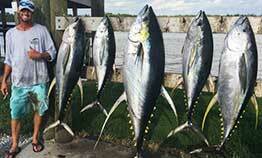 These are NOT small fish and put a hurting on my anglers as tuna are pure muscle. It is an awesome feat when you land one. Are you up for the challenge? That’s the report for now. I have a few dates left in May and several in June/July. Please call me to make a reservation for your Tuna Adventure and I look forward to fishing with you. It’s now April and the bite is still wide open! 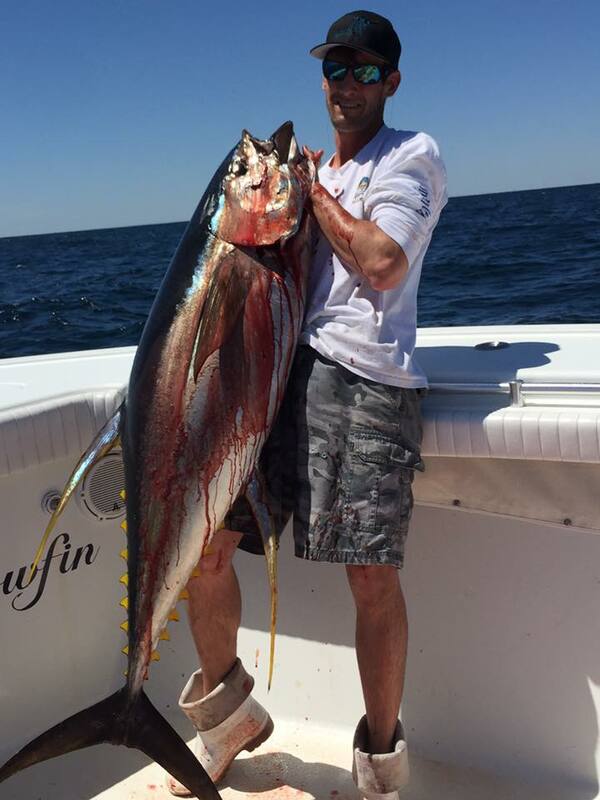 We have been consistently been catching big wahoo and and huge yellowfin tuna. We are only running about 25 miles from the pass burning around 130 gallons. So get with us while we still have some dates open. 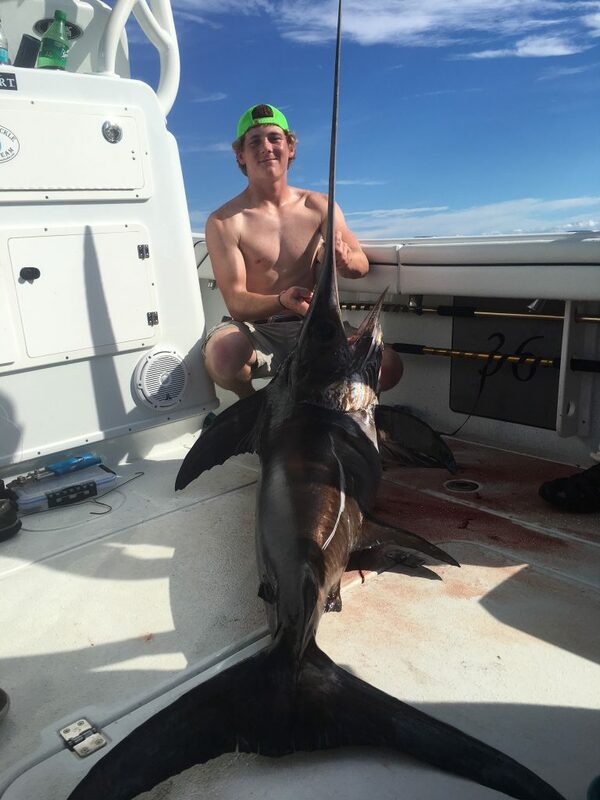 Last trip out we had Collin, Hunter, and Jake down to Venice from Texas to target Yellowfin Tuna and a Mako shark. These guys were great and everyone had an awesome time. 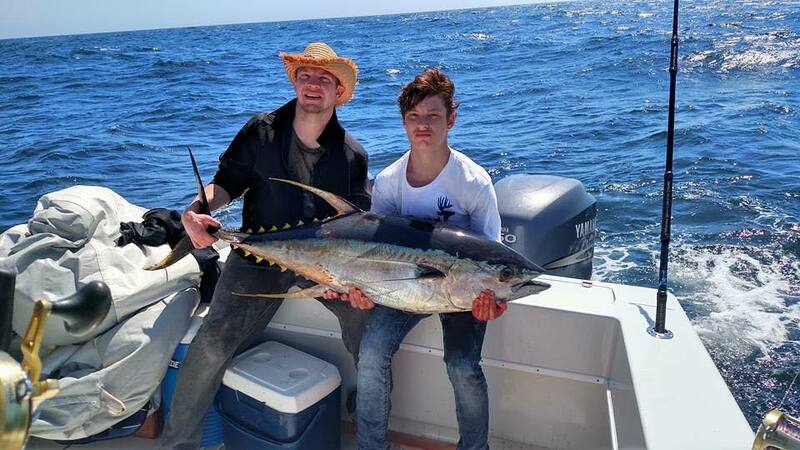 The tuna fishing here in Venice LA was phenomenal. The lump bite has really fired off and if you have been waiting to get in on the action now is the time. We literally had fish under the boat all day! Big ones too!! 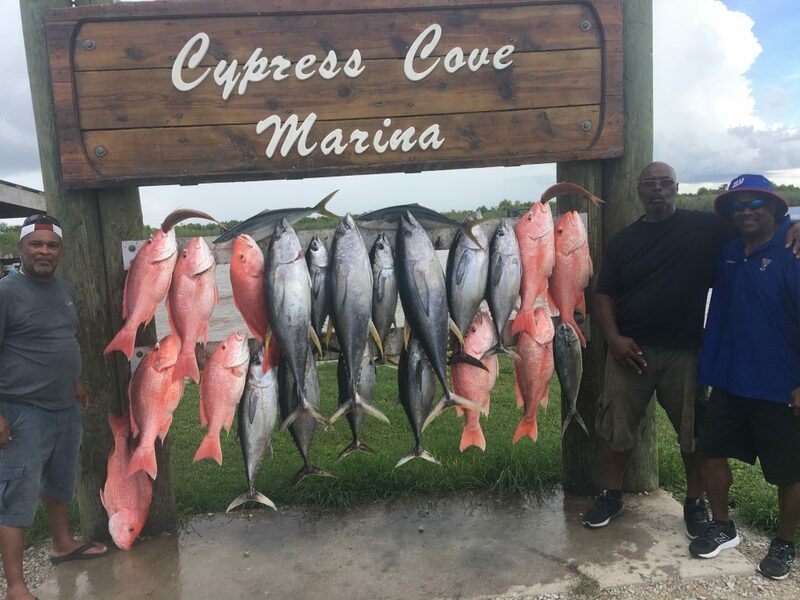 Days like this are common for this time of year while fishing in and around Venice Louisiana, We took a gentleman’s limit and kept 6 but you could have caught all you wanted. When the fish we were catching were the size they were, 2 per person is really the best way to go. 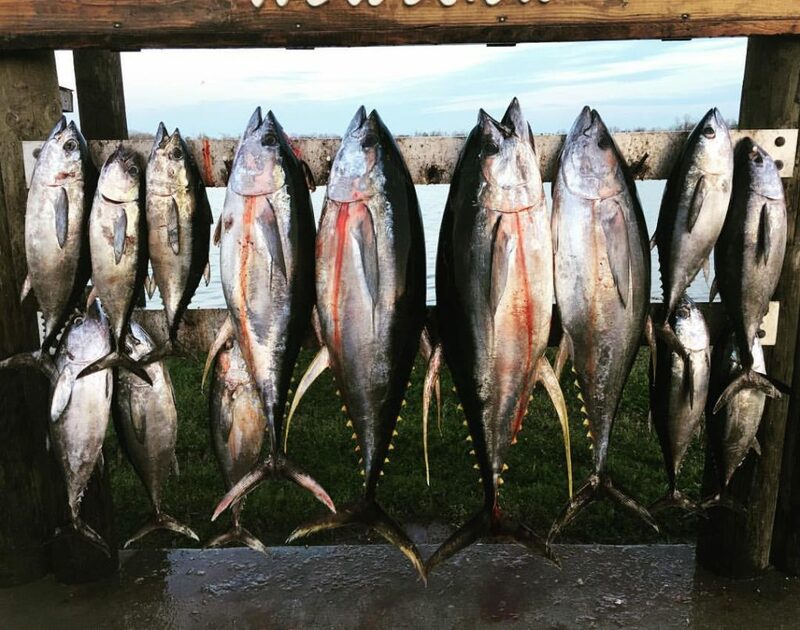 Yellowfin tuna having about a 70 % yield it’s usually more meat than you know what to do with. Our fish we landed that day were from 70 to 171 lbs and they filled 3 huge ice chest. I expect this bite to last in this area until late March as they will start moving to deeper water off the shelf after. 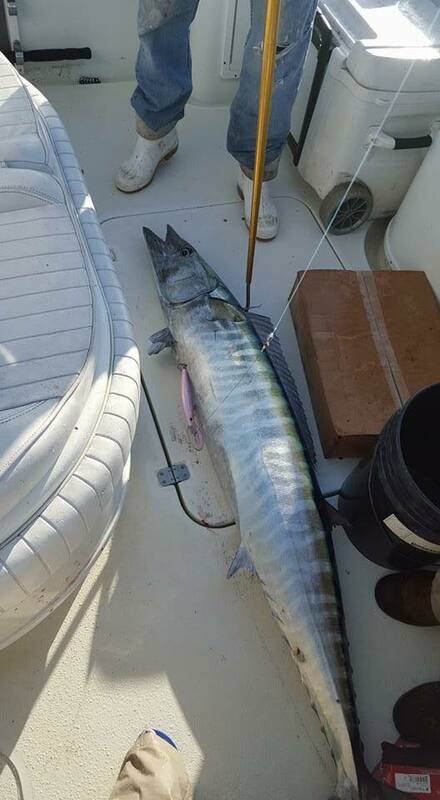 This is also a great time to target Wahoo in Venice LA. Some days we pick up both when things play into our favor. We never got the MAKO they were after but everyone had a great time. We still have plenty of dates available and want to get you and your group out there. We have been fishing everyday and haven’t had time to do a report. But I am making a conscious effort to get some video for our clients and managed to get some footage the other day. I hope you enjoy this video and if are looking for a venice fishing charter, please give us a call.